Join us on April 20th, 2019 and snag a custom deal (and a sticker) ON TOP of our amazing 420 deal – 30% OFF EVERYTHING – flower, concentrates, pre-rolls, edibles, apparel, and paraphernalia ALL DAY. 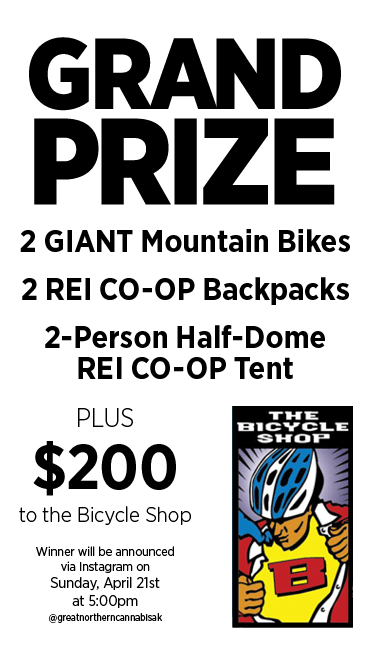 Featuring a GIANT 84-inch Wheel of Cannabis at our Downtown location and a GIANT 6-foot Plinko board at our Dimond location, you could win any of our selection of great deals on products, giveaways, or on of over $2,000 in gift cards to local businesses! 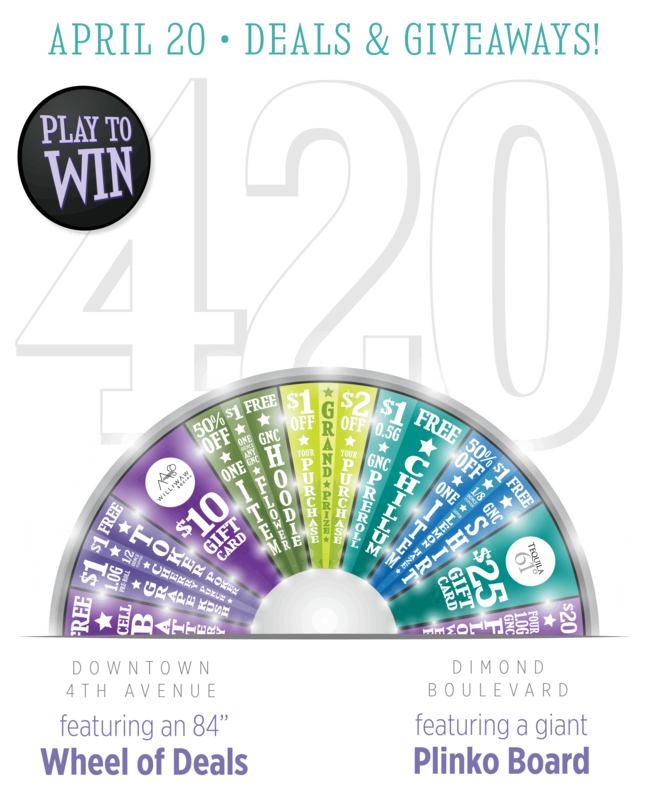 Play to WIN on 4/20! See below for more information. Page in Progress. Please check back later for more information or any updates, cancellations, or exciting news. Gift Cards from local businesses: including Williwaw, Tequlia 61, and our food vendors! FREE Apparel, Pipes, Bongs, Rolling Papers, Grinders, Toker Pokers, and more! Prizes subject to change. No purchase necessary to play. Win your deal before you make any purchase. Only one turn per customer, on April 20th, 2019. Every contestant has a chance to win GRAND PRIZE; Grand Prize to be announced. Chance to win depends on quantity still available. *Food vendors will be available while their supplies last, or until 5pm. We love our local, Alaskan community! More sponsors to be announced. Gift cards will be split between locations based on availability and approximate location to our stores. Would you like to sponsor our 420 event? Please email jenna@gncak.com! "I love this dispensary! The shop, the staff, and the flower! The sales are awesome, and the discount after 10 visits is not too shabby also. Great work!" "This is the Apple Store of Cannabis. Sleek & chic, privacy, and really cool staff. Great $12 pre-rolls on selected strains and yes, they are good strains." "I went here for the first time yesterday and, besides parking, it's the best shop I've been to thus far. Customer service was excellent, as the staff was friendly and professional." "To my knowledge they are the only shop in town that prices their weed according to quality instead of charging the same for 18% THC and 10% THC." "...Add in the aesthetic interior decorating and I see little reason to give my business to the other shoddy shops ever again." "This is an awesome shop–great variety, great staff, great layout, and great prices! There's no reason to go anywhere else, because this store has the best variety of strains and the best prices." "I love this place!! The staff was soooo helpful & they got me a great discount! Their hours are so convenient and now I don't have to go all the way on the other side of town." "Super sweet location and set up! I love this place. Cheapest place in town right now and their staff is just amazing! I love the smell of retail and cannabis and this gives you BOTH!! Thank you!!" "Very upscale retail store, friendly staff, and great location in the heart of downtown Anchorage! This is an awesome store well worth visiting!" "I highly recommend this shop on a number of levels… the best prices I have seen in town… out of all of the places I have been in Anchorage, I recommend these people number one!!" "I literally started dancing when I saw the menu for the first time." "Great flower selections and excellent service. 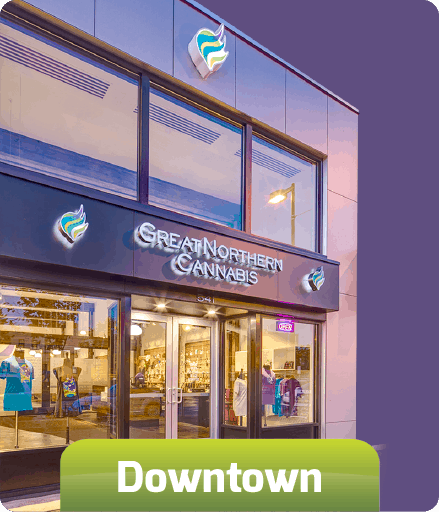 The employees are very friendly an knowledgable, theres always a positive vibe at Great Northern Cannabis – my favorite dispensary hands down!" "The flower is consistently of high quality. Specifically, it's neatly trimmed, typically rich in terpenes, smokes well, and produces excellent highs. I've tried multiple strains from multiple growers, and there are several good ones out there. This brand is one of the good ones." Visit Us Downtown or on Dimond! 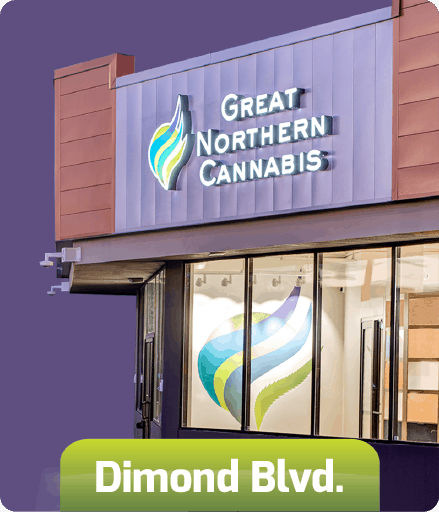 ©2019 Great Northern Cannabis. All rights reserved. Marijuana has intoxicating effects and may be habit forming and addictive. Marijuana impairs concentration, coordination, and judgment. Do not operate a vehicle or machinery under its influence. There are health risks associated with consumption of marijuana. For use only by adults twenty-one and older. Keep out of the reach of children. Marijuana should not be used by women who are pregnant or breastfeeding. Alaska regulation 3 AAC 306.360(e) requires users to be twenty-one or of older age in order to consume marijuana.